Christian Symbolism is an artistic representation, an outward expression, or object, that has shades of various, often hidden meanings. The most commonly used symbol is probably that of the Cross. For each of us, the Cross will have various levels of meaning according to our life's experience .. .this symbol can convey a wealth of ideas, concepts, scriptural quotes, experiences of suffering etc. We need symbols in our spiritual journey, they can be points of focus that lead us into deeper prayer. They all have an ecclesial dimension. They are part of our patrimony in the Church and perhaps it would be a good idea to explore again — or possibly for the first time — their inner meaning and message. In the early era of the Church during the times of Christian persecution, the use of symbols was very prevalent, and a means of being identified as to belonging to Christ, thus witnessing to other Christians. They were if you like, the password in times of persecution. Christian symbols can be seen carved upon the graves and walls of the early Christian catacombs in Rome, especially St Priscilla, Domitilla, and Calixtus. By taking time to reflect upon each individual symbol we are brought into timeless contact with our brothers and sisters of the Christian Faith down through the ages and here it is important to remember our Catholic teaching on the Communion of St.s, all those past and present: the Church Militant on earth, the Church Suffering in Purgatory, and the Church Victorious in Heaven — all alive to one another, praying, interceding for one another. Our Christian symbols could be used much more creatively within the catechetical field where children, and those young in the faith, will grasp them in their beautiful simplicity and begin to appreciate the profound meaning within them, for each contains a entire treasury of thought, a repository of the experience of life in the Faith in its many joyful, painful and hopeful dimensions. Let us explore together these symbols. The anchor has always been a sign of safety, hope, and security, for its primary function is that of mooring a ship or boat. The safety of a ship in specific dangerous waters could depend entirely on its ability to throw the anchor and stabilize the ship. 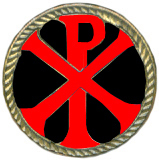 The early Christians combined the symbol of the anchor with that of the Cross, thus proclaiming that Christ and His saving Passion were the one true security, the one sure way to attain Heaven, in times of persecution this symbol was a powerful image to those caught up in the various reigns of terror. It witnessed to the fact that Christ was the true anchor in the storm of life, the true security, and that His Cross, the path of suffering would lead all eventually to the heavenly shore, beyond all pain, suffering and anguish. Hope in Christ, (see Hebrews Ch 6 verse 19 ) was seen as the soul's anchor. The whole imagery brought back to the memory and minds of the early Christian the life and experiences of the Apostles, so many whom had lived the lives of fishermen, and in light of the fact that Jesus called them to be, “Fishers of men.” (St. Matthew 4.19). This symbol of the Anchor and Cross is very easy to draw, and this simple exercise has the potential to root the concept in our mind, and in times of trouble we will be able to recall it, for the benefit of our souls. Many of the early Church Fathers refer to the Barque, the ship of Peter, the symbol of the ship represents Holy Mother Church upon the high seas of life. It is the nature of a ship that it is always on a journey, it has a destination and a purpose. It will traverse many dangerous waters and pass through many trials but with Jesus (our Compass) we will arrive upon the Eternal Shore. A good crew will be faithful to their Captain, no matter how difficult and life threatening the paths through the waters may be, they will never abandon the ship — and neither must we for She is our Mother. Mary, the Mother of God depicted as a ship is also an image of the Church. The following medieval carol expresses this very well. It is profoundly beautiful and well worth reflection. and has a mighty mast. She has within her store. The Holy Ghost her mast. The symbol of the fish has been used from very early Christian times (second century) — it can be found in the Catacombs of St. Callistus (our16th Pope). The Greek word for fish is ICHTHYS. Because of the miracle of the Loaves and the Fishes, it is also associated with the Holy Eucharist. The whole of the gospel is contained in these words: Jesus ...Yeshua, Savior. Christ ... the Anointed One. Son of God. The One Who saves. It is a complete prayer in itself and as such has been used by countless millions down through the ages. In particular it recalls to mind all “Pilgrims” who carry nothing for the journey, and for whom this is their constant prayer; in fact, faithfulness to this prayer alone can bring a soul to great holiness. For some people, the concept of “Fishers of men” is actually repugnant and offensive, they feel it implies a trap or a snare, not so, to the Semitic mind, the sea was a place of danger, a place where the evil spirits resided ... they understood this call of being fishers of men a call to save others from sin and the power of the evil one. May the Holy Name of Jesus always be on your mind and in your heart. The Pelican in Christian art is a symbol of charity, and a symbol of the Holy Eucharist. 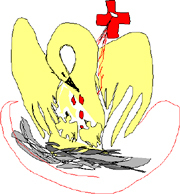 The symbol depicts the Pelican plucking at her breast with her beak, then feeding her young with the blood that issues forth. It has therefore come to symbolize Christ's sacrificial love for the whole of mankind. Love HIM totally Who has given Himself totally for you. This is a Greek abbreviation of the title, “Christ”. “Chi” and “Rho” are the first two letters in the Greek word Christos or "Christ". In Greek capital letters they appear as “X” and “P”. In Greek Chiro, to anoint, and in Hebrew mashah denoted a cultic consecration. Through consecration, a king, a priest, a prophet, an altar were specially set part. The anointing would confer the Holy Spirit's power, making Him (Christ) the anointed one, in Hebrew, the Messiah of the Lord. The New testament applies to Jesus the Old Testament texts concerning the anointing of the King-Priest. A priestly anointing was not narrated of Jesus, because He was the high priest, not like Aaron but according to the order of Melchizedek. While a prophetic anointing had been attributed to Jesus it was related to His baptism. Jesus is the anointed Messiah. We have all been anointed at Baptism and are called to be other Christ's, in own vocations, other “Christs” — in our being Catholic Christians. It stands for Christ the Conqueror, from the Greek contractions IC (Jesus), and XC (Christ); Nika is Greek for Conqueror. Let us remind ourselves that Jesus Christ has conquered sin and death, He is the Ultimate Ruler of all. He is Lord. We all know that in an earthly sense a conquering hero has fought many battles ... but Jesus Christ is the final Victor over all conflicts and wars. JESUS, the only Name under heaven by which we may be saved. Jesus, the Holy Name, the name so loved by so many Saints of the Church. It is said of St. Francis of Assisi that when he uttered the Holy Name, he licked his lips, for he said the name of Jesus contained such sweetness. The Franciscan St. Bernadine of Sienna did a great deal to promote the praying of the Holy Name, the Name of Jesus should be held in the greatest of reverence and respect — and never profaned. Our God has allowed us to call Him by His Name! Probably the most well known and most loved of the Christian symbols is the simple sign of the Cross. How many prisoners and captives have found solace and strength in beholding an indentation in the soil traced out as a cross, or have drawn upon a dirty window pane the form of the Cross, or even to of observed the crossing of two blades of grass, or branches of a tree? How many soldiers far away from home who fell in battle, have had their mortal remains marked with a line of pebbles, or intertwined twigs forming the Cross of Christ? Many people have been saved from suicide after having focused their attention upon a Cross, whether a man-made symbol or a sign within nature? 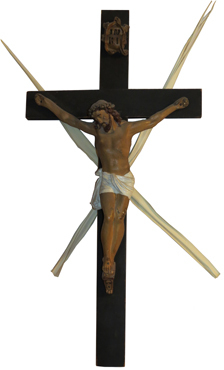 A simple Cross or Crucifix is a sign of salvation and hope, a reminder of the jewel of our Christian faith, we are also comforted in our belief in its power to defend us from evil and to overcome the great adversary, the devil and his demons. We are, however, accustomed to consider the Sign of the Cross (Signum Crucis) as wholly a Christian symbol, originating with the crucifixion of our Redeemer. This is quite erroneous. In ancient Carthage it was used for ornamental purposes. Runic Crosses were set up by the Scandinavians as boundary marks, and were erected over the graves of Kings and heroes. Cicero tells us that the augur's staff with which they marked out the heaven was a cross. The ancient Egyptians employed the same as a sacred symbol, and we see on Greek sculptures, a cake with a cross. It was also a sacred symbol among the Aztecs long before the landing of Cortez. All this can be seen as a prefiguring, a preparation of humanity for the greatest Cross and Self- giving in love that the world would ever know, on Calvary. It also adds weight to the fact, considering its primitive religious associations, that crucifixion was a deliberate mockery of the “gods”. The barbaric roman practice of crucifixion was for the lowest and most heinous crimes. But by Christ’s sacrificial offering on Calvary, the hitherto sign of shame became a sign of glory. In heraldry there are twelve different crosses. Quite common in ancient sculpture. long before the Christian era. ... is common to several Egyptian deities, as Isis, Osiris, etc. and is the emblem of immortality and life generally. The symbols above are of interest to us as Catholics inasmuch as they underscore our understanding of the development and journey of humanity ever deeper and deeper into the God. We should treasure and reverence the sign, the mark, the symbol of the Cross, in darkness and suffering, it is the symbol that will bring the greatest solace and blessing to our souls. In the time of Jesus the lamp was molded out of clay, it was round and flat, had a pinching on one side to contain the wick, and was fuelled with olive oil. (Olive oil had many uses and was considered precious, as it was a valued foodstuff, also it was a source of light, it could alleviate pain, cleanse wounds, strengthen the sick, and mixed with perfume it was offered to guests as a sign of respect). The Lamp once lit, was placed on a stand and was never permitted to go out, it burned, bringing warmth and light within the house day and night. It was also regarded as being made for enlightenment, and could symbolize vigilance, the prophetic word, and the presence of God. It was a reminder to the Jew of the Holy Tabernacle, and so therefore had deep religious significance. Judaism was the cradle of Christianity, and the light that burnt before the Tabernacle in the wilderness was a forerunner to the Vigil Light that ever burns before Jesus in the Most Holy Sacrament of the Altar. Lamps and lights have been used symbolically to represent the life and existence of the soul, both among the living and the dead. The Romans are said to have preserved lamps in some of their sepulchers for centuries. In the papacy of Paul III, one of these lamps was found in the tomb of Tullia (Cicero’s daughter) which had been shut up for 1,550 years. At the dissolution of the monasteries a lamp was found which is said to have been burning for 1,200 years. Two are preserved in Leyden Museum. Jesus Christ is the Light of the World, the Light of the cosmic world and the light of our inner world; He is the Light that the darkness can never extinguish. His word is a lamp to our path (Ps. 118). Lights are signs of hope, symbols that draw us to the Eternal Light. Light is only needful where darkness falls. Be it actual or spiritual, let us follow the Light of Christ. Shine upon us, O Light of Christ! The Laurel figures largely in history, even to this day. The Laurel is an evergreen tree which carries large, oval, hardy leaves. The Greeks gave a wreath, a crown (stephanos), to the victor in the Pythian games. The Romans gave a crown of triumph made of laurels to a general who obtained victory. St. Paul likens the spiritual journey and mission to that of a runner at the games. “Have you learned anything from the stadium? Many run, but only one gets the prize. Run, therefore intending to win it, as athletes who impose on themselves a rigorous discipline. Yet for them the wreath is of laurels that wither, while we run for a wreath that will never die.” (1 Corinthians 9.24) We have all seen the recent spectacle of the Olympic Games in Greece and elsewhere, the efforts that all participating had to make, but they kept the goal ever in view. So we, too, need to keep our eyes on Jesus, and run ahead for the crown that awaits us in Heaven. When a sister dies, she is placed in her coffin fully dressed in her habit, veil and kerchief, a crucifix in her hand, her vow card upon her heart, and upon her head a crown of laurels, interspersed with flowers, for she has run her race and now awaits the crown of glory she will receive from her Lord. There is a beautiful reading in the apocryphal book of 2 Esdras chapter 2.42 onwards. Let us keep the goal in mind, let us keep our eyes on Jesus, heaven awaits us, all is passing ... Jesus will be our prize and the joy of the Blessed Kingdom. Al Hadira A.D. 62 was called The Lion of God, because of his religious zeal and courage. Arioch BC 1927 The Lion, King of Assyria. Henry, Duke of Bavaria was called, “The Lion", because of his daring and bravery. Richard I, Coeur de Lion (Lion's heart) so called for his bravery. There are many expressions of Lions within Heraldry, numerous postures being assumed, as well as many stories pertaining to lions in Classical mythology. Probably the most familiar Christian symbol of the lion is applied to St Mark, who is depicted as a lion. The origin of this is said to be the fact that St. Mark begins his gospel with scenes of John the Baptist and Jesus in the wilderness. Indeed at the time of the writing of the gospels, lions still inhabited caves within Palestine. 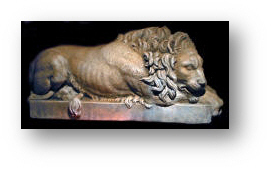 A less known concept is the Lion as a symbol of the Resurrection. According to tradition the lion's whelp is born dead, and remains so for three days, and when the father breathes on it, it receives life. Probably the most beautiful usage of the lion imagery in recent years are the allegorical stories of C.S Lewis, “The Chronicles of Narnia”, in which the main figure is the lion, Aslan, (an image of Christ). These stories are in one way timeless, showing the fight between good and evil, of which Aslan is always the victor. The central theme of, “The Lion, the Witch and the Wardrobe” within the Narnia Chronicles is the Pascal mystery. The symbol of the Lion is a powerful one, if you have not read the chronicles of Narnia, please do, they are suitable for children of all ages, as well as adults, and can be understood on many levels. The Lion of the tribe of Judah has conquered! In Christian art the stag has come to typify piety and religious aspiration and longing. The Stag symbolizes solitude, prayer and purity. so my souls longs for You O, God. This beautiful animal is possessed of such grace and majesty, and deservedly is used to represent the human soul. Indeed the famous Victorian engraver Edwin Landseer called the stag, “The Monarch of the Glen”. His freedom of mobility captivates our imagination and speaks to us of the freedom of soul we would like to have. His fearlessness in combat is what we would like to imitate in our encounters with evil. Who could ever forget seeing the silhouette of this noble animal against a lonely sky? According to Pliny, the reason why the stag symbolizes Christ is the superstition that it draws serpents by its breath from their holes, and then tramples them underfoot. The Stag is also depicted in artistic representations of some Christian Saints, St Julian the Hospitaller, St Felix of Valois, and St Aidan being among them. Let us too long for the Living water symbolizing, the Word, the Holy Spirit, Jesus Christ himself. The Keys, permitting the opening and closing of doors, symbolizes the one who possesses authority and dominion over a kingdom. The ancient keys were about a yard long, made of wood or metal. On public occasions the steward placed the key on his shoulder, hence to have the key upon one's shoulder meant to be in authority, to have the keeping of something. The power of the keys is the supreme authority vested in the pope as successor of St. Peter. St. Peter is always represented in Christian art with two keys in his hand, they are consequently the insignia of the papacy, and are borne saltire-wise, one of Gold and the other of Silver. The supreme Pontiff has the God-given authority to open or close the doors on the Treasury of the Faith and its practice, and to unlock and reveal the truth to us as children of the Church. Ours is to offer loving obedience to the Church, obedience in the fullest sense of the word of listening and putting what we hear into practice. The symbol of the Peacock was used in art very early into the Christian era, it decorated some of the tombs and walls in the actual catacombs. The Peacock represented immortality, this stemmed from the ancient legend that the flesh of the peacock did not decay, thus its association with the Resurrection of Christ. In addition the “multitude of eyes" upon its stunningly beautiful fan tail, suggested the all-seeing eye of God and that of the Church. This beautiful bird is indigenous to India. It was brought to King Solomon by his ships from Tarshish, in which case its origin was probably the Malabar Coast or Ceylon. It is a great pity that this colorful and captivating bird is mostly associated in our minds as a symbolism of pride, “Proud as a Peacock". “By the Peacock!”, was once a common oath which was thought to be sacred, precisely because of it being a type of the Resurrection. In the book of Genesis we read of Sarah's Egyptian slave-girl, Hagar, being cast out into the wilderness. There in the desert Hagar experienced God, as the One who Sees! 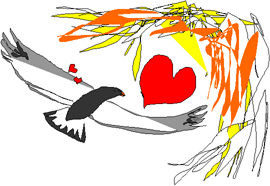 In other words, God was aware of the insecurity, pain and desolation of her life; He saw, and had Hagar, with her unborn child, and their future all in his heart and hand! We should take courage from this story, that whatever predicament, trouble, trial we find our life to be in, God sees it all, He KNOWS! And He is loving us through it, and calling us beyond it ... He is the God Who sees! He notices us, small and insignificant as we are. Truly our God is a God of consolation. Let us look upon the Peacock with new eyes and reflect on what its eyes say to us! The eagle is a magnificent bird with a large wingspan. It nests in inaccessible rocky crags, in high places, which make it a symbol of heavenly beings. When the time comes for young eagles to learn to fly, the mother takes one eaglet upon her wings and soars high above the land. She then shakes the young one off to make its first attempts at flight. If she sees her young in any trouble, she dives beneath it, catches it on her wings and soars aloft again to repeat the learning process. The eagle is also often depicted as the bird that takes, carries a person from danger up to a safe place. “I will bear you up, on eagles wings!” one popular hymn tells us. And from the book of Revelation we read of the woman who had given birth to a male child (Jesus) and was in danger of being consumed by the great dragon (the devil). “Then the woman was given the two wings of the great eagle so that she might fly into the desert where she would be looked after ...” (Rev. 12.14). The eagle was used as an emblem long before the Christian era. It was the ensign of the ancient kings of Babylon and Persia. The Romans adopted it in conjunction with other devices, but Marius made it the ensign of the legion. The Romans also were accustomed to let an eagle fly from the funeral pyre of a great emperor. An Eagle in the heraldic language stands for fortitude. An interesting symbolic expression of the eagle is that seen on some lecterns or pulpits in churches. The eagle is the natural enemy of the serpent. The two Testaments are the two outspread wings of the eagle. On which can often be seen a large open Bible. Its historical usage has led many to utilize the image to signify power, authority and strength, among them Austria, Former Prussia, and Russia, to name a few. Many poets and artists have written about the eagle, and it continues to fire the imagination of man. Who can forget that wonderful scene from “The Return of the King”, (The last film in the Ring Trilogy), where the hobbits Frodo Baggins and Samwise Gamgee, their mission accomplished, sitting upon a lonely craggy mound, surrounded by the disintegrating mountain, and rivers of molten larva ... when all seems lost... The exhilarating sight of the appearance of the great eagles coming down to rescue them and carrying them away from the fire and darkness! The eagle in Christian art is emblematic of St. John the Evangelist, because like the eagle he looked upon, “the sun of glory.” The Word of God has the power to raise us up on eagles wings and bring us to Heaven. The Lily in Christian art is a well known symbol of chastity, innocence and purity. In pictures of the Annunciation, or Salutation, the Archangel Gabriel is sometimes depicted holding a Lily branch, or Mary herself is clasping a Lily, or there is a Lily in the vicinity. O Lily glistening white and stainless! There is an old tradition that the Lily sprang from the repentant tears of Eve as she went forth from paradise. Here Mary can be seen as the New Eve, the Mother of life, who bore the fruit that redeemed us all from sin and every fall. The Lily in the language of flowers means, “Majesty”. The Lily as we know it today is a trumpet like flower, stately and noble. Its large petals open and surrender to the light. It exudes a beautiful perfume, and bears a high pollen yield. The white Lily when it is full open resembles a star. It is a flower of great beauty and it is easy to see why artists have so often placed it within pictures of the Holy Virgin. However in Biblical times Lilies, shushan was a collective term for all the various flowers of the field, lilies, crocuses, irises, tulips, narcissus, all of which came forth from a womb like tuber. A solitary symbol can be a great focus for reflection and prayer, perhaps you would like to obtain a Lily and place it at your shrine, prayer space, or take to the classroom. A lily is not very easy to draw but a symbolic Lily could easily be made out of white paper. It could be a catechetical focus and also to give added meaning; put, or ask the children to place their prayer petitions in its centre and then present the flower to Mary ... pray and use these symbols creatively. They blossom, all of them, in eternity. Signifying the union between Jesus and Mary: Jesus Christ in the Incarnation took His flesh from Mary even while He remained eternally God with the Father. Hence, we state in the Nicene Creed that Jesus is True God and True Man. FILE then Print... then Selection and then Print) If you simply want to print the image, RIGHT-CLICK on it and choose Print Picture.